The contemporary realist painting of Brian Keeler is represented here to offer you an easy view of a selection of his art. His paintings have won wide acclaim during the course of his career and they are represented in many private, public and museum collections. Several prestigious galleries in the northeast United States show his work and his home studio in Wyalusing, PA also has a gallery where many original works and prints are on view. One thing that struck me about your work is you don’t seem to fit into any known category. Your work is sort of like Academic Realism – sometimes even like Superrealism – it’s a little like Impressionism – but not really – occasionally you do a Magritte-like Surrealism, and there’s what I referred to at gallery night as that “hopped-up hyper-reality” like Van Gogh’s work – a sort of hyper-awareness. 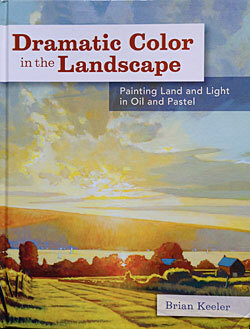 In 31 years of editing art magazines, I can’t think of many other artists whose artwork is as varied, accomplished, or expressive as the pictures Keeler has created during his long career. He is an exceptionally talented, intelligent, and dedicated artist, and it has been a great privilege to share his work with readers of these publications. Above all, he is an intelligent, passionate artist who deals with aspects of the visual world that can be analyzed and explained, as well as those that are purely emotional. 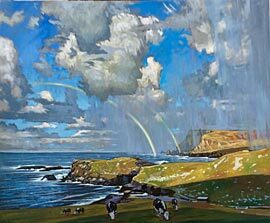 "Atlantic Arias" The new show of Brian Keeler's depictions of coastal Ireland, Scotland and Maine will be shown at the Laura Craig Gallery in Scranton (January and February) and then at the North Star Art Gallery (March and April) in Ithaca in 2019. 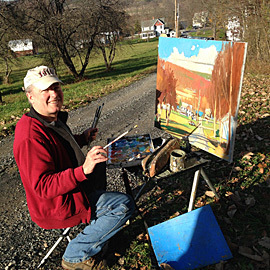 Brian Keeler - painting a plein air oil above the Susquehanna River in Sugar Run, PA. Brian was the top winner in a recent national contest sponsored by Plein Air Magazine - for best plein air painting.